Today’s post: Find over 40 Thanksgiving side dishes to make ahead of time so you can cook less and enjoy more on Thanksgiving Day! Thanksgiving is coming up, meaning many of us are about to spend more time cooking in one day than we usually do in an entire week (or month!). I love cooking, so making Thanksgiving dinner is something I look forward to, but the clean up drives me batty. We have an open kitchen/dining/living room, which means that a huge mess in the kitchen is on display for everyone when it’s time to sit down for dinner. As a result I’m always trying to get most of the cooking mess cleaned up before we sit down to eat, which is almost impossible when I’m making 8-10 different dishes. So in the past few years I’ve started using more and more make ahead recipes for my Thanksgiving side dishes. And by “side dishes” I mean basically everything but the turkey! I do almost all the prep work days before or early in the morning on Thanksgiving, meaning all those pots and pans and measuring spoons can be through the dishwasher and put away before the guests arrive. Then things stay warm in crockpots or get baked in their serving dishes so the kitchen isn’t a mess when we sit down to eat. It’s fantastic! 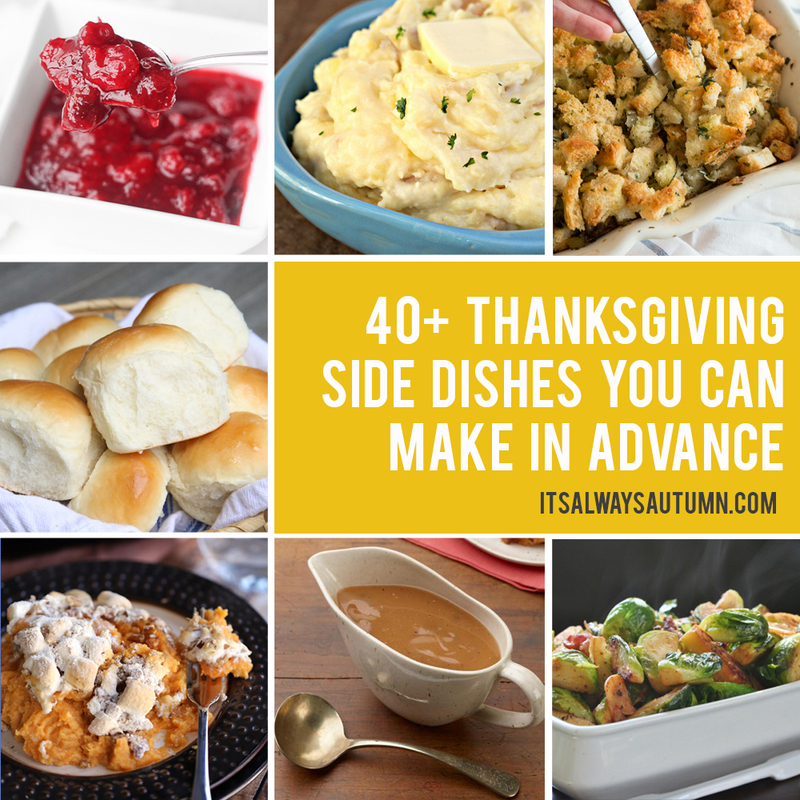 Today I’ve gathered over 40 side dishes you can prep in advance for Thanksgiving. Some you can make the day before or early the morning of, while others can be made months in advance and frozen! You’ll find make ahead mashed potato recipes, make ahead stuffing recipes, make ahead sweet potato recipes, make ahead vegetable recipes, and even make ahead gravy, cranberry sauce, appetizers, and fruit fluff salads. Check the end of the list to find out how to make homemade roll dough in advance and freeze it until you’re ready to bake! As with all roundup posts, if you’d like to pin an individual recipe please click through to the original source to do so. Feel free to pin the collage image above to remember where to find all these ideas in one place – thanks! 1. 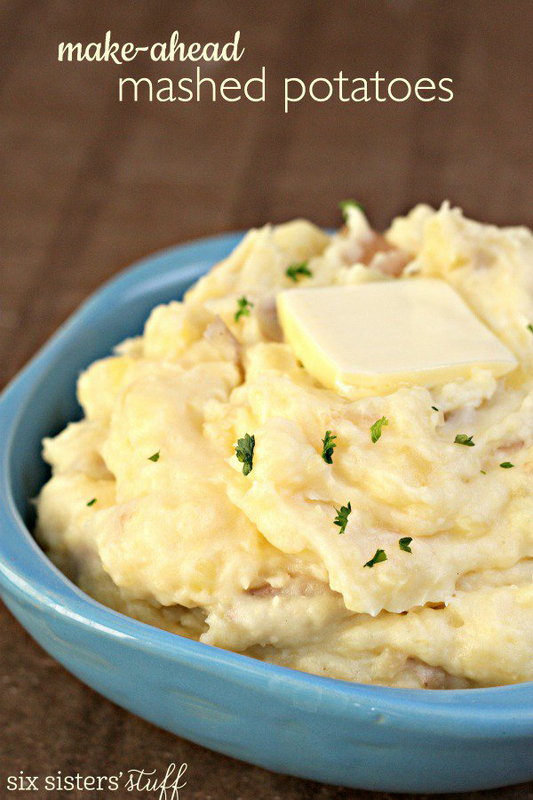 These mashed potatoes from Spend with Pennies cook in the slow cooker, meaning they don’t even require boiling! Just chop and season the potatoes in the morning and let them cook all day. You can mash them a few hours ahead of time and let them stay warm until you’re ready. 2. Make these mashed potatoes from Six Sister’s Stuff the night before and keep them in the fridge. 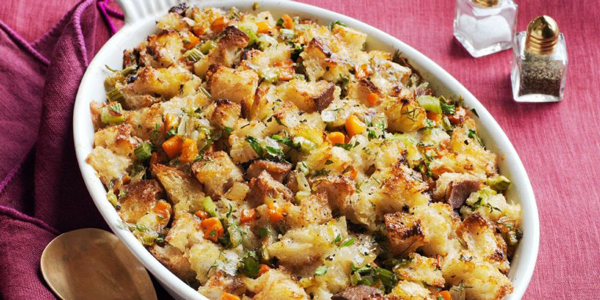 Then bake them on Thanksgiving for a no-fuss side dish. 3. 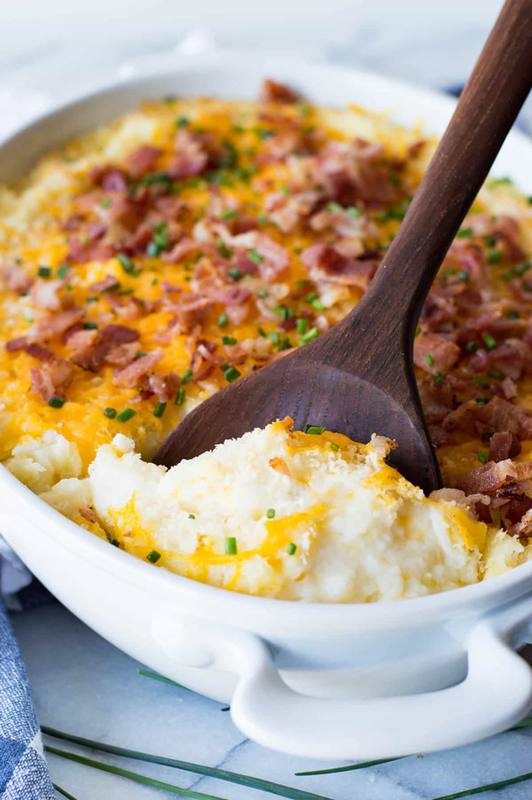 This make ahead mashed potato recipe from House of Yumm adds cheese and bacon for a loaded mashed potato casserole. 4. 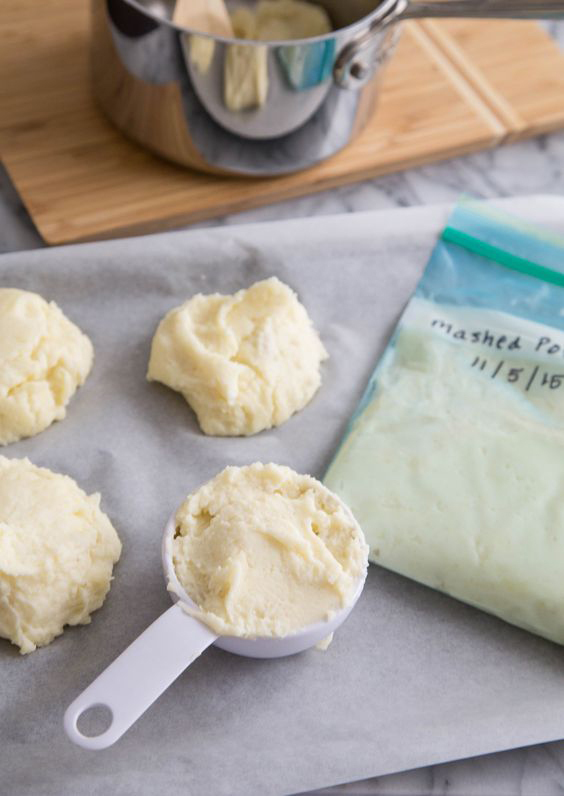 This post from The Kitchn teaches you the best ways to freeze and reheat mashed potatoes. 5. 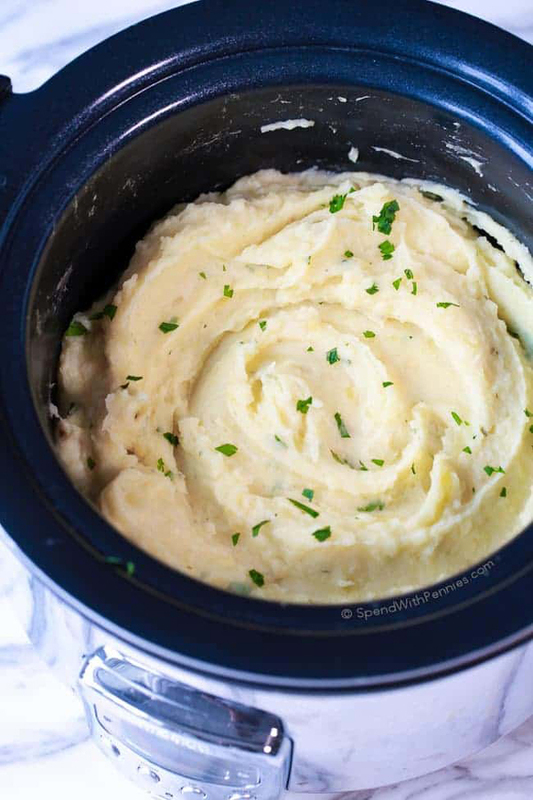 These garlic herb mashed potatoes from Meal Planning Magic can actually be frozen months in advance! 6. 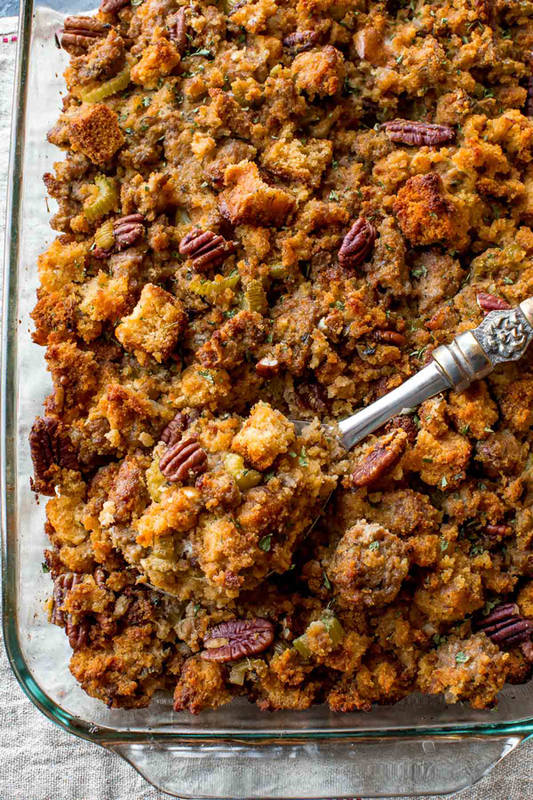 Call Me Betty has a recipe for a classic Thanksgiving stuffing that can be make the day before, and then baked through the day of. 7. 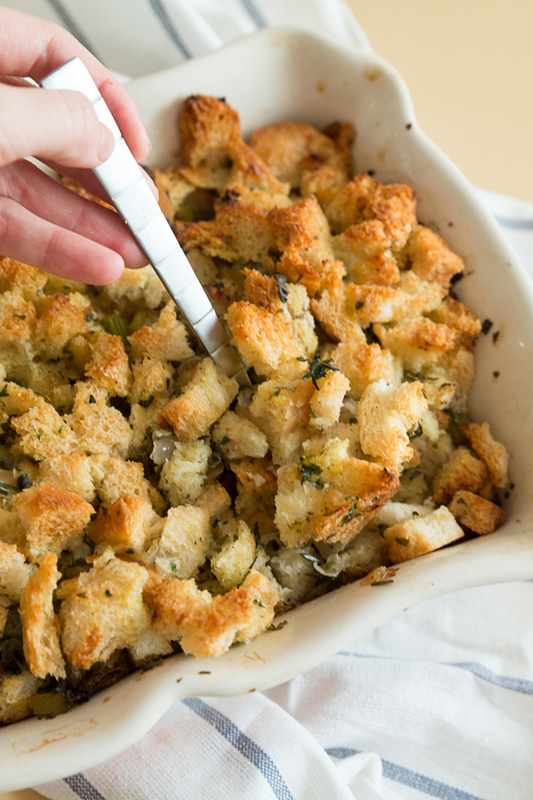 If you prefer cornbread stuffing (dressing), try this make ahead version from Sally’s Baking Addiciton. 8. Laughing Spatula shares a recipe for make ahead Ciabatta, Sausage and Apple Stuffing that looks incredible! 9. 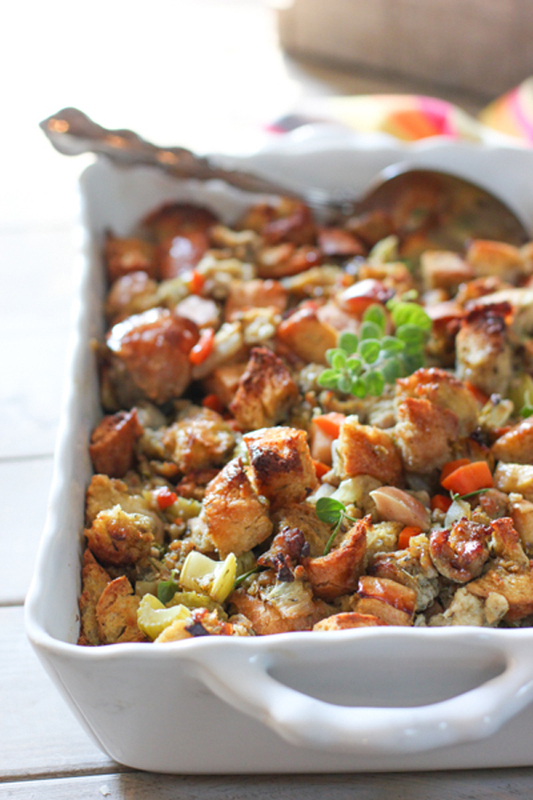 Or try this Cheddar and Herb Stuffing from Woman’s Day. 10. 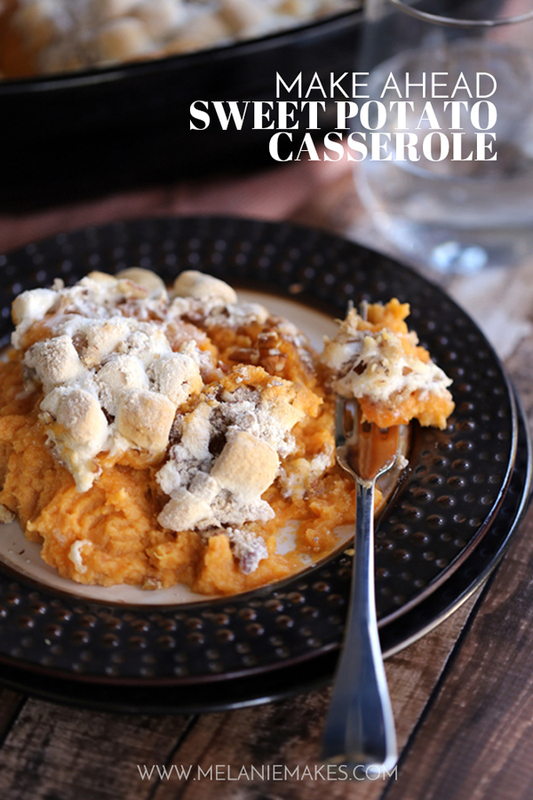 This classic Sweet Potato Casserole (complete with mini marshmallows) can be made early in the day and served at room temp whenever you’re ready. From Melanie Makes. 11. 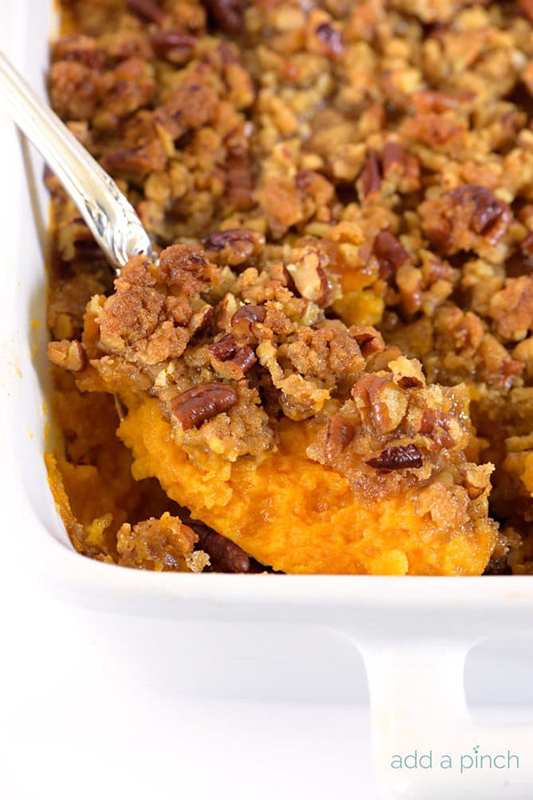 Make this pecan-topped Sweet Potato casserole from The Spruce the day before Thanksgiving to free up time on the day of. 12. 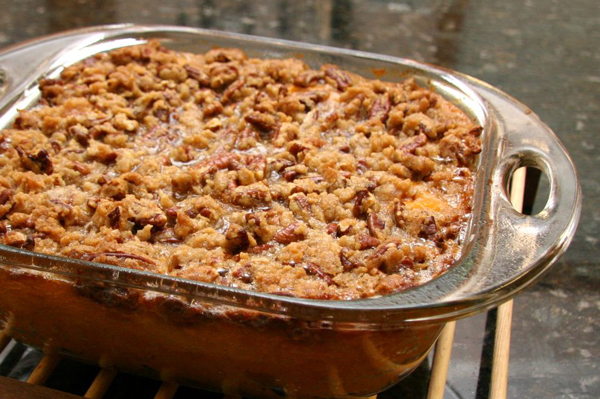 Add a Pinch shares a streusal-topped Sweet Potato casserole recipe that can be made up to three months in advance and frozen! 13. 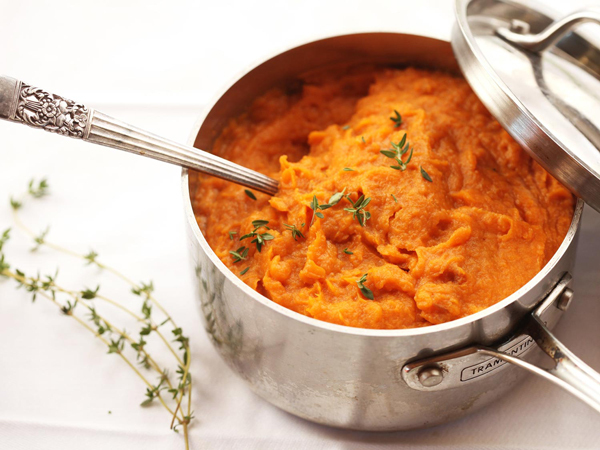 These mashed sweet potatoes from Serious Eats can be made in advance and frozen. Check out the post for tips on how to reheat. 14. 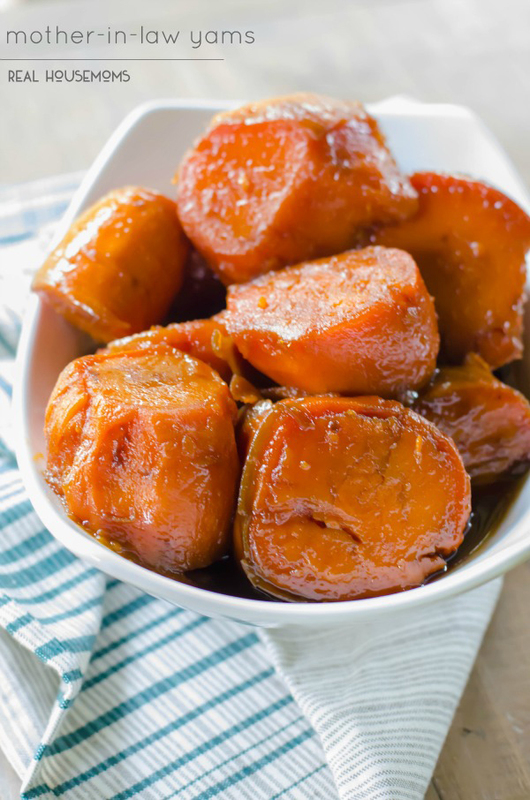 Try these make ahead Candied Yams from Real Housemoms for an easy Thanksgiving side dish you can make the day before. 15. 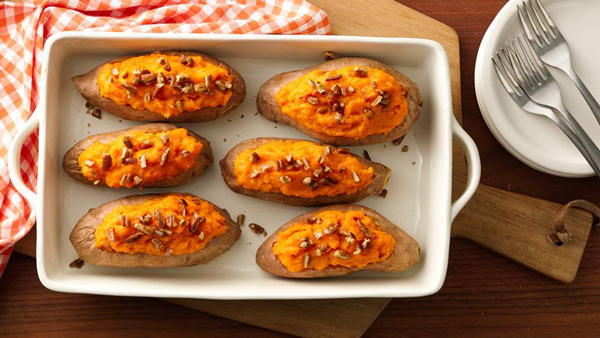 Or try these make-ahead twice baked Sweet Potatoes from Betty Crocker. 16. The Food Network shows you how to make your gravy ahead of time so there’s no last minute fussing with it when everyone’s ready to eat. 17. 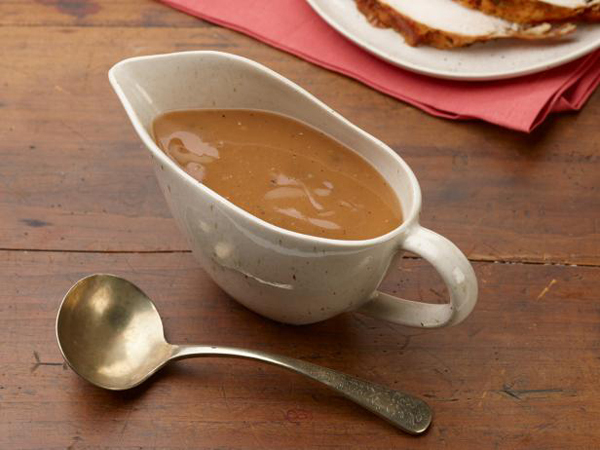 Or try this recipe from The Kitchn to make your gravy weeks in advance and freeze it. 18. This make ahead cranberry sauce from Ahead of Thyme only takes 15 minutes and 4 ingredients! 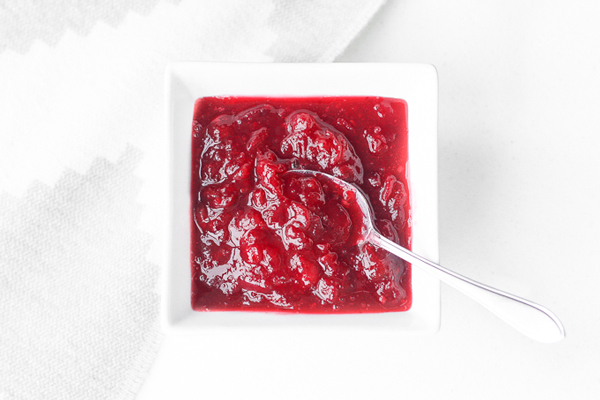 her post gives lots of ideas for what to do with leftover cranberry sauce, too. 19. The Pioneer Woman’s version of make ahead cranberry sauce adds orange zest. 20. 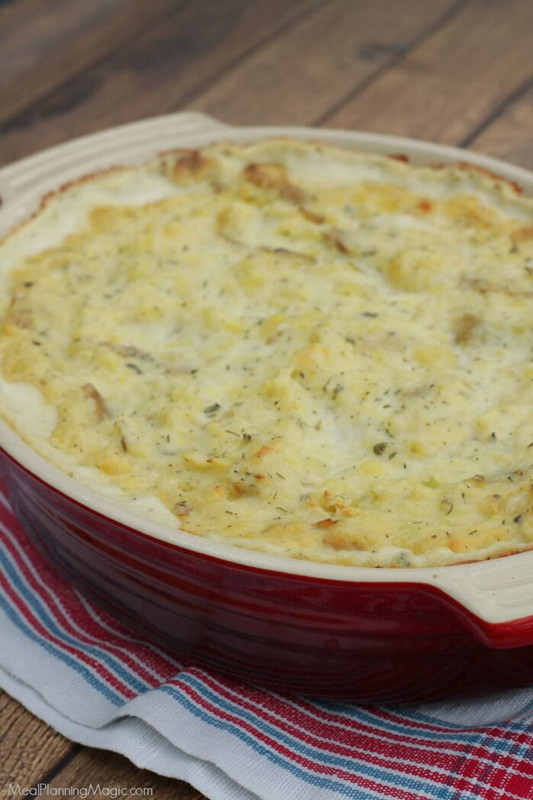 The creamy vegetable casserole from Lord Byron’s Kitchen is like green bean casserole but better and can be made up to three weeks in advance and frozen until Thanksgiving. 21. 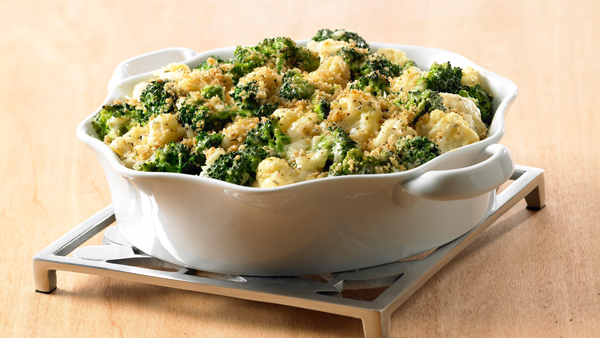 This broccoli cauliflower casserole can be made the day before and refrigerated until time to bake. Use fresh or frozen veggies! From McCormick. 22. 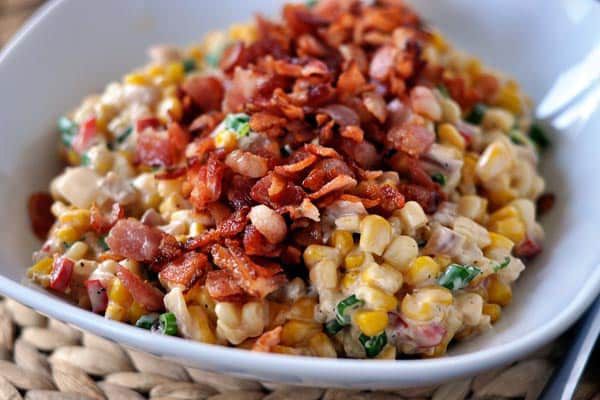 Creamy confetti corn from Mel’s Kitchen Cafe can be made up to two days in advance and then just baked on Thanksgiving Day. 23. You can even make brussel sprouts the day before Thanksgiving! 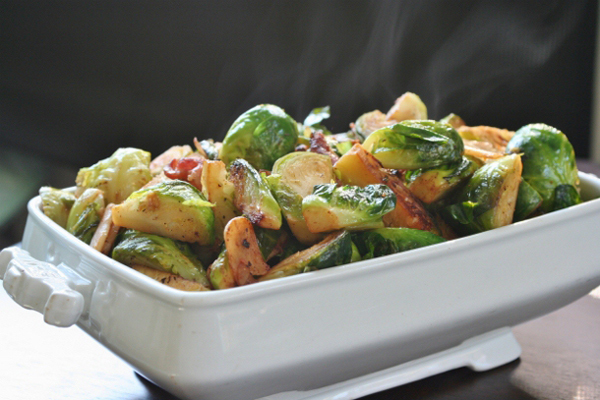 Try these brussel sprouts with bacon from A Sweet and Savory Life. 24. This recipe from Learn 2 Grow shows you how to prep the brussel sprouts the day before, and then roast on Thanksgiving day. 25. 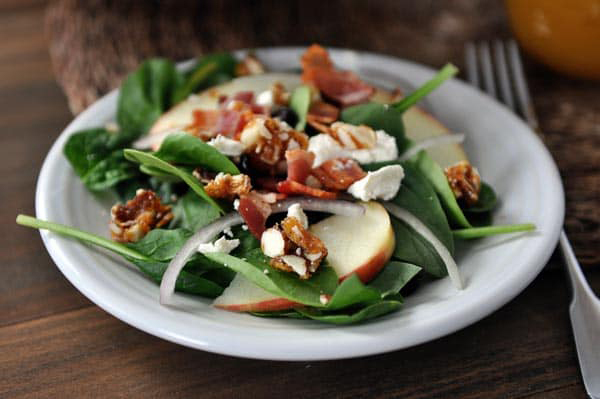 The components for this delicious spinach salad from Mel’s Kitchen Cafe can be made days ahead of time, meaning all you have to do on Thanksgiving is toss everything together. 26. This Thanksgiving slaw will stay crisp and delicious for up to two hours, meaning you can make it before you put the finishing touches on the rest of your meal and it will still be delicious! From The Kitchn. 27. 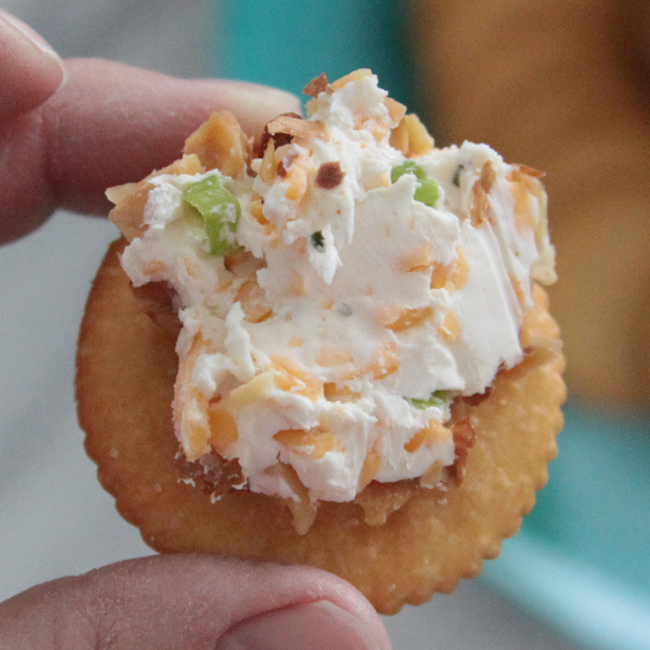 This bacon ranch cheeseball from It’s Always Autumn is always a hit and can be made a day or two in advance and kept in the fridge. 28. 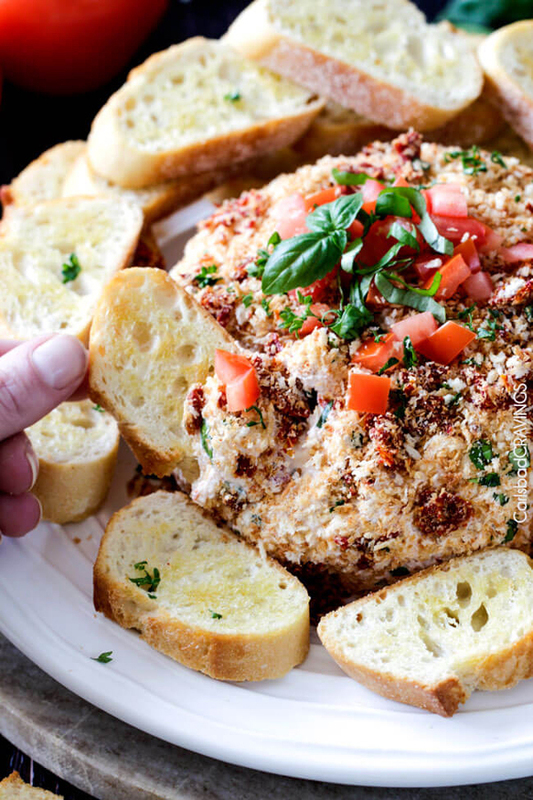 Or try this bruschetta cheeseball from Carlsbad Cravings – it looks incredible! 29. 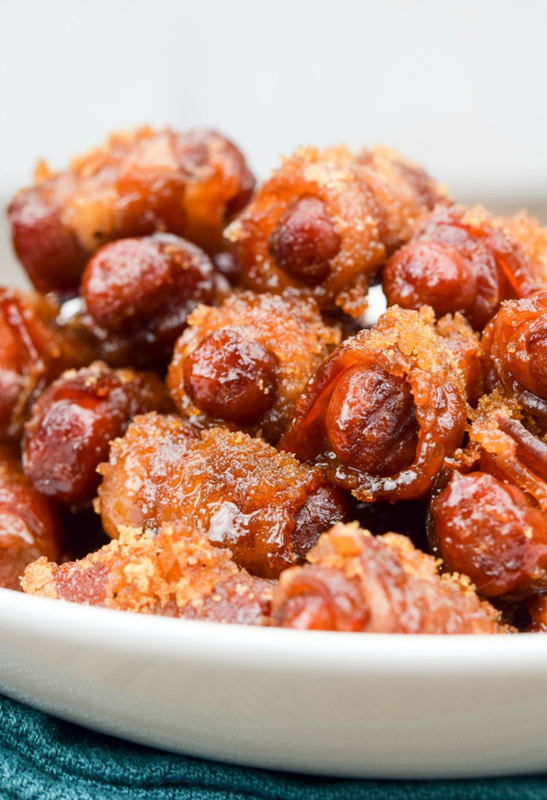 These bacon wrapped smokies from Gonna Want Seconds can be prepped and frozen weeks in advance, and then baked on Thanksgiving for an amazing appetizer. 30. 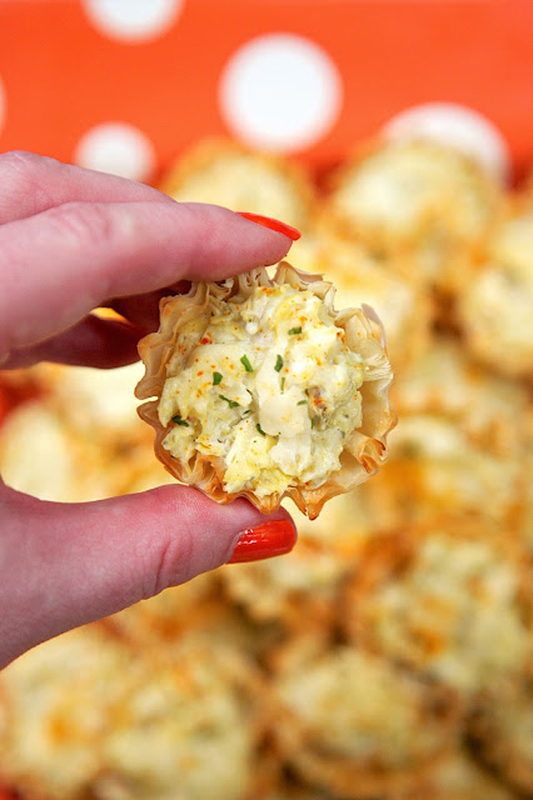 You can assemble these artichoke parmesan bites from Plain Chicken ahead of time, freeze them, and then pop them in the oven for a quick appetizer. 31. 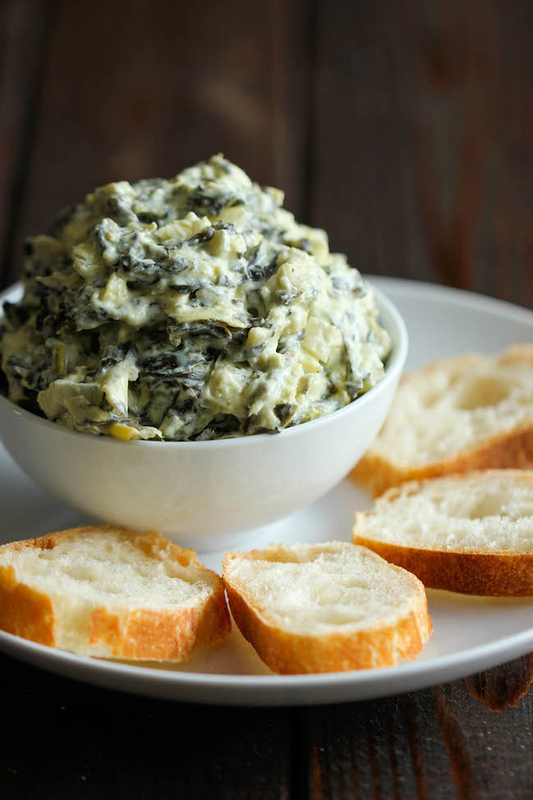 Dump all the ingredients for this Spinach Artichoke Dip from Damn Delicious in the slow cooker and let it take care of itself while you make the rest of the meal! 32. 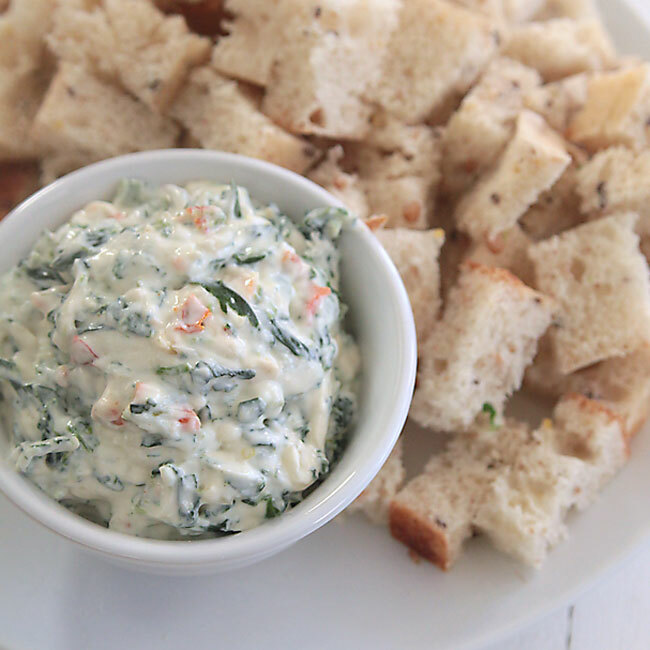 If you’re looking for a lighter spinach dip, try this version with just a quarter of the calories from It’s Always Autumn, and make it hours before you start the rest of the meal. 33. 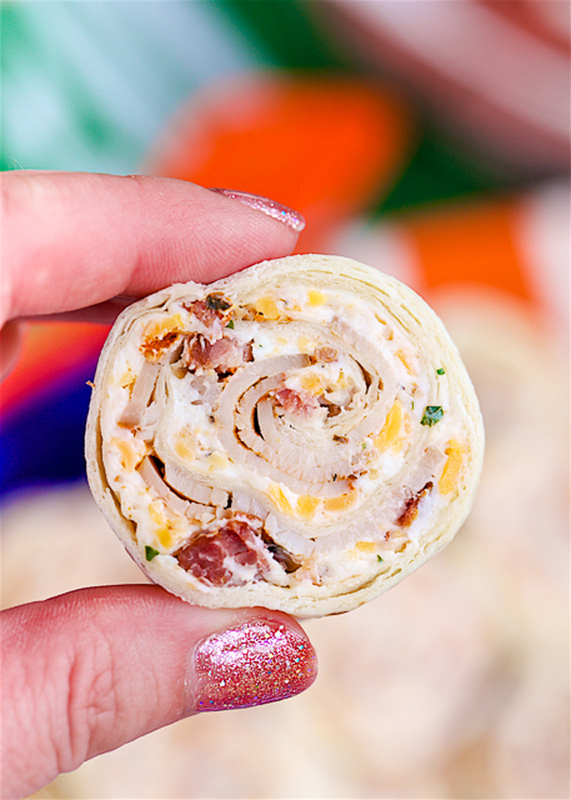 These ranch bacon turkey pinwheels from Plain Chicken last for several days in the fridge, making them a perfect make ahead Thanksgiving appetizer. 34. 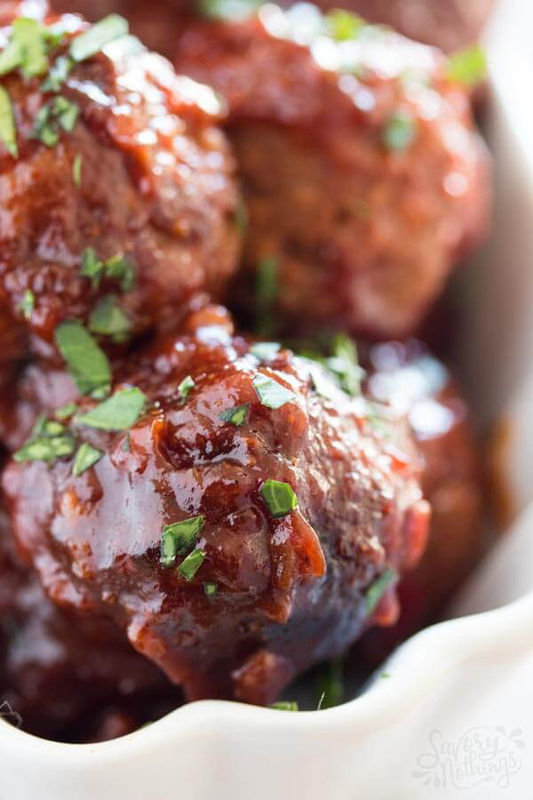 Make these meatballs ahead of time and freeze them in the sauce, then dump it all in the crockpot for amazing Sticky BBQ meatballs on Thanksgiving. From Savory Nothings. 35. This post from The Kitchn tells you everything you need to know about making deviled eggs in advance. 36. 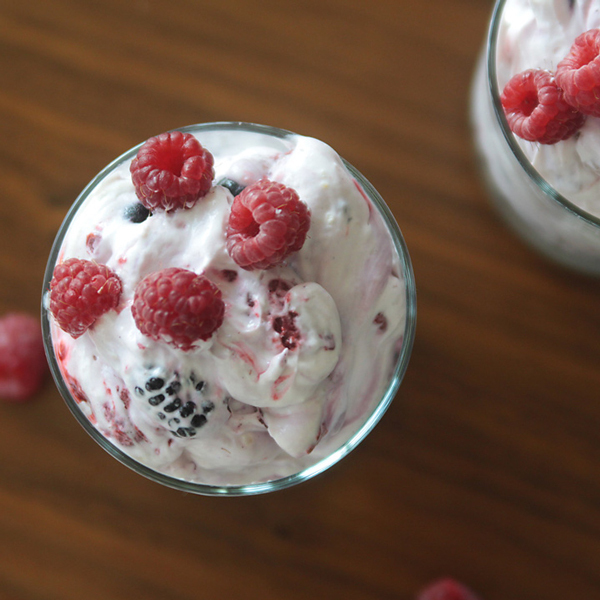 Triple berry cheesecake fluff from It’s Always Autumn is a delicious side that can be made early in the morning, freeing up time before dinner. 37. 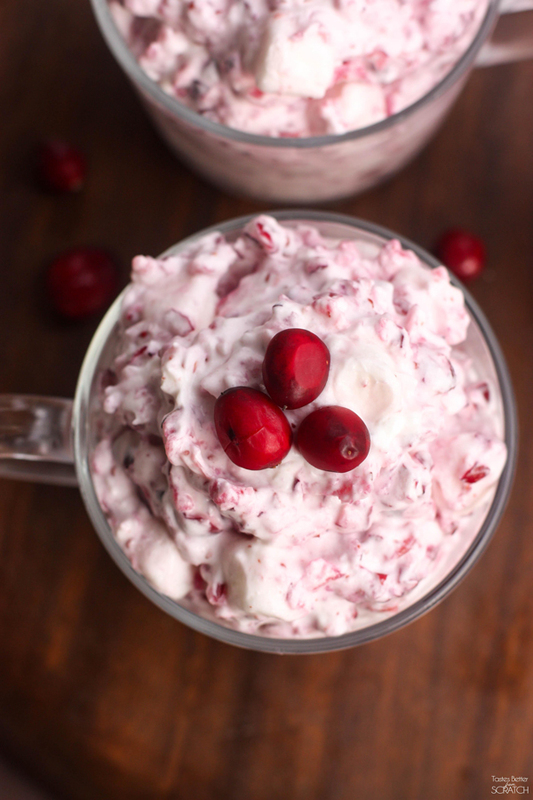 Or try this cranberry fluff from Tastes Better from Scratch which can be made the night before. 38. 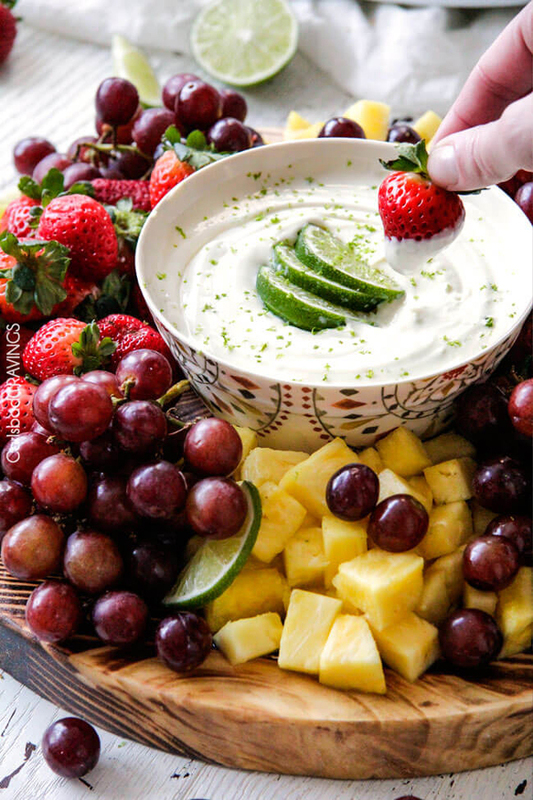 Key lime cheesecake fruit dip can be made a day or two ahead and then served with fresh fruit for a no-prep Thanksgiving appetizer. From Carlsbad Cravings. 39. Visit this post from It’s Always Autumn to learn how to make rolls dough in advance and refrigerate or freeze it until you are ready to bake. 40. 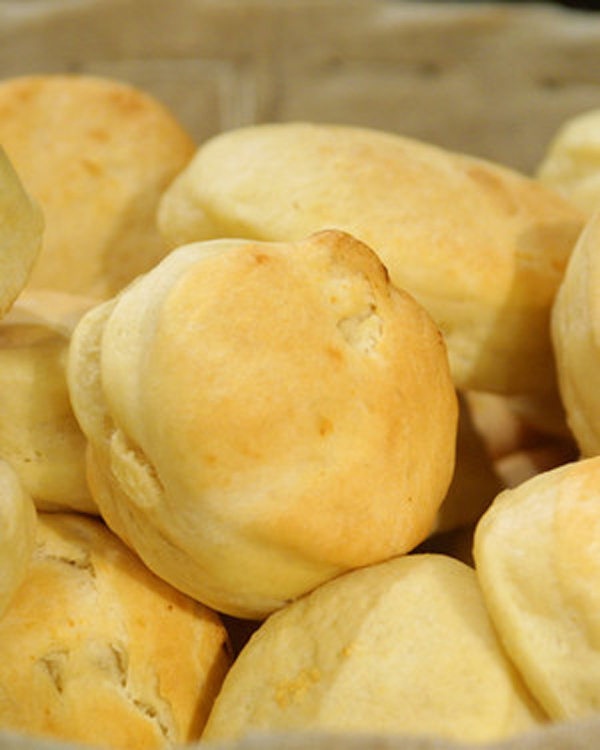 Here’s another mix now, bake later roll recipe from Martha Stewart. 41. 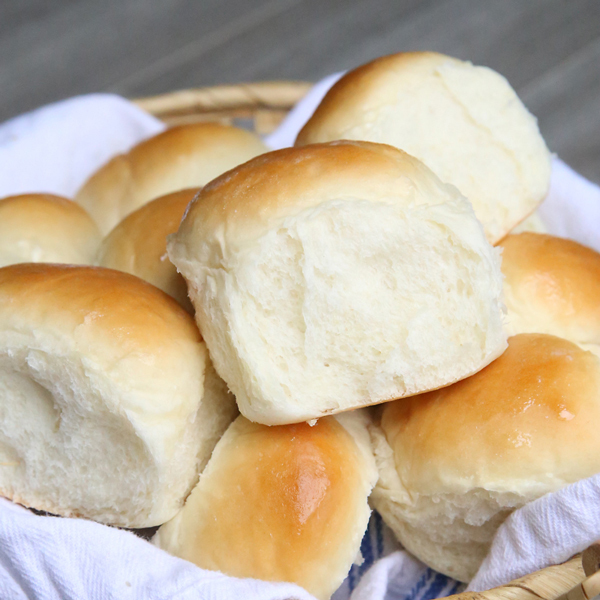 Or give this recipe a try: the dough for these rolls (also from Martha Stewart) can be made ahead and stored in the refrigerator for up to two weeks. 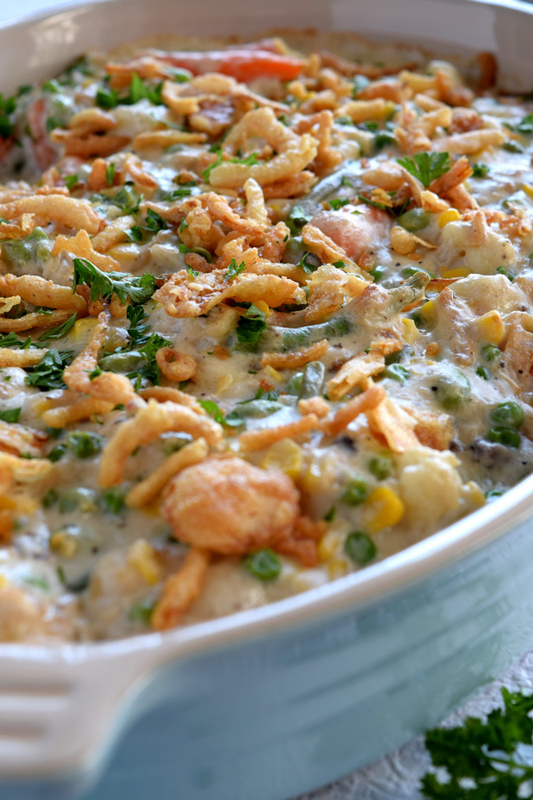 Hey, I hope you enjoy some of these Thanksgiving side dish recipes to make in advance, and Happy Thanksgiving! « Quick + easy sweet Jiffy cornbread recipe everyone will love! It makes me anxious for Thanksgiving all except the make ahead gravy there is no way I’m going to be cooking body parts of a turkey I’ll never eat just to get drippings, way too much work. I’m a white meat kinda girl and making gravy right before dinner is no problem for me, takes 5 mins. plus I use the potato water in the gravy. I have used your cook the potatoes earlier in the day and keep warm in a crock pot suggestion often love the idea. True! I thought the make ahead gravy was a LOT of extra work too, but maybe someone out there likes the idea!